A Hereford Beefstouw has a pleasant atmosphere where you sit in amongst the polished brass brewing vats. The menu is a novel mock newspaper and it always seems to plenty popular with the locals. The main reason for visiting is the food - if you like beef, then you will love this place. The beer from Bryggeriet Apollo is good stuff and makes a very good acompianment to the food. Not a cheap meal, but the roast beef starts at decent price. Bryggeriet Apollo has it's own website. Reef'N'Beef offers a bit of Ozzy charm in the centre of Copenhagen and a chance to try something a little bit different. The kangaroo is superb, as is the steak for the less adventerous. I have not yet been brave enough to try the crocodile starter. It is very easy to spend money in here, so make sure you check the prices first if you are on a budget. Whatever you have, you will enjoy it though. One of my favourite lunch venues is Café på 4 (Café on 4) at Illum. It offers a nice selection of lighter bites as well as drinks. A very pleasant place to have a sit after a nice wander round Illum. 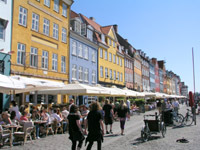 Havfruen (The Mermaid) is just one of the many pubs and restaunts on Nyhavn. A great place for a lunchtime meal or an evening drink. Wonderfully relaxed and a fantastic spot to sit and watch the stir. I don't want to spoil the surprise, but Promenaden does one of the best racks of ribs I have ever tasted, done in their own special recipe sauce. A seriously big plateful, which thankfully comes will all the right equipment to tackle it and clean yourself up afterwards. Balkonen is one of the slightly more upmarket restaurants inside Tivoli, without jumping up to either of the two Michelin starred restaurants. It is very popular with the locals, particularly on Friday evenings ahead of Fredags Rock as it has a view over the open air stage. Nyhavn (New Port) is the picture postcard touristy centre Copenhagen, with its unmistakable colourful buildings. There are lots of bars and restaurants here and it has a very lively atmosphere, particulary of an evening. You will find quite a few buskers enteraining the restaurant tables. You can also take a canal boat tour from the Kongens Nytorv end. Strøget (The Streets) is the collective name for the pedestrianised streets around the centre of Copenhagen. There are all manner of shops along here, from coffee shops and bars to big department stores and designer boutiques. There are quite a few smaller streets off Strøget which are worth a nosey, with some slightly more esoteric shops down them. Heading up towards Norreport from Illum, you will find Rundtarn (The Round Tower) which offers fantastic views over the city. It is also very unusual in that the way up is a spiral ramp rather than stairs. Description of Illum. Busker with digeridoo. Description of PB Chokolade. Run by the Bagger family. For me the quickest way into the city was by S-Tog, the local trains. Depending upon where you want to be, either Københvan Hovedban (central station) or Nørreport are the handiest stations. Trains are relatively cheap, particularly if you buy a kipperkort (clippercard).